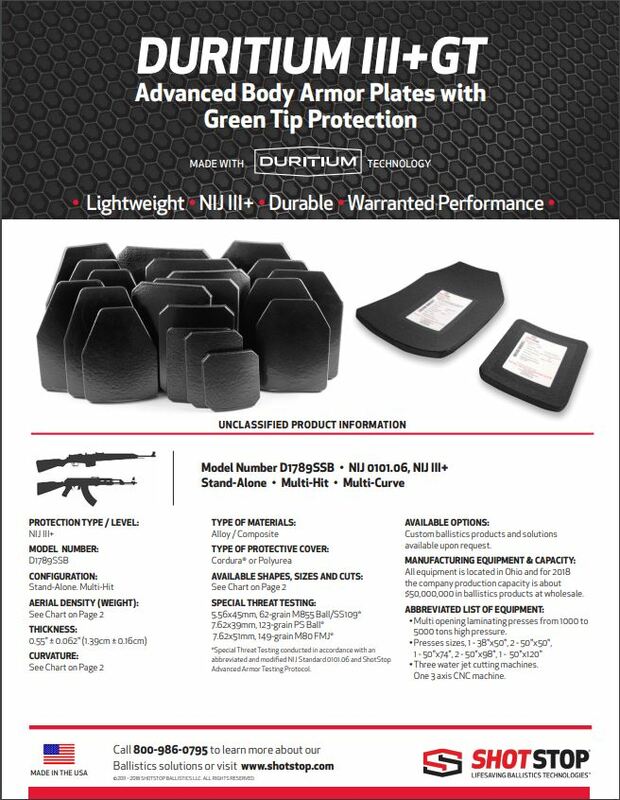 What is special about ShotStop Duritium Ballistic Plates? We want to hear from you! MVT 2019 Training Survey! I was so impressed by the ShotStop® Duritium® Level III+ Special Threat GT (Green Tip) Ballistic Plates that I became a dealer. 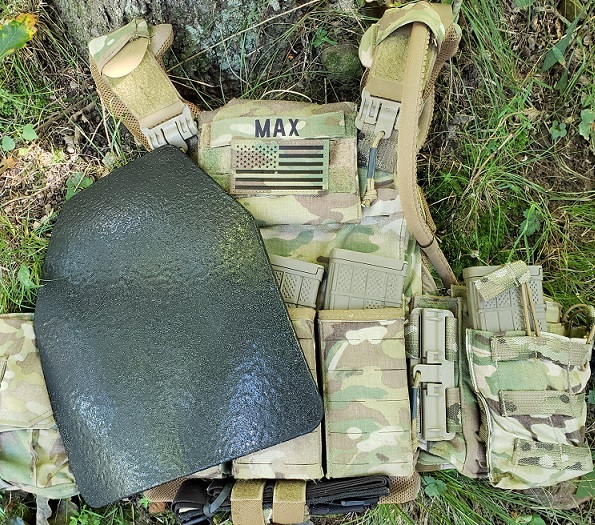 Although I have focused so far in the gear store on the Level III Special Threat Plates, you can purchase any of the ShotStop products through MVT. 2) Whether the plates are effected by heat (locked car in the summer) as dyneema is? 3) What is specific about the alloy composite on the GT plates? What is it made of? I understand that it is the powder that stops the penetrator before the Duritium backer finally stops it? You are 100% correct in that Duritium® is not Dyneema (made by DSM), nor is it SpectraFiber (made by Honeywell). These are both UHMWPE. 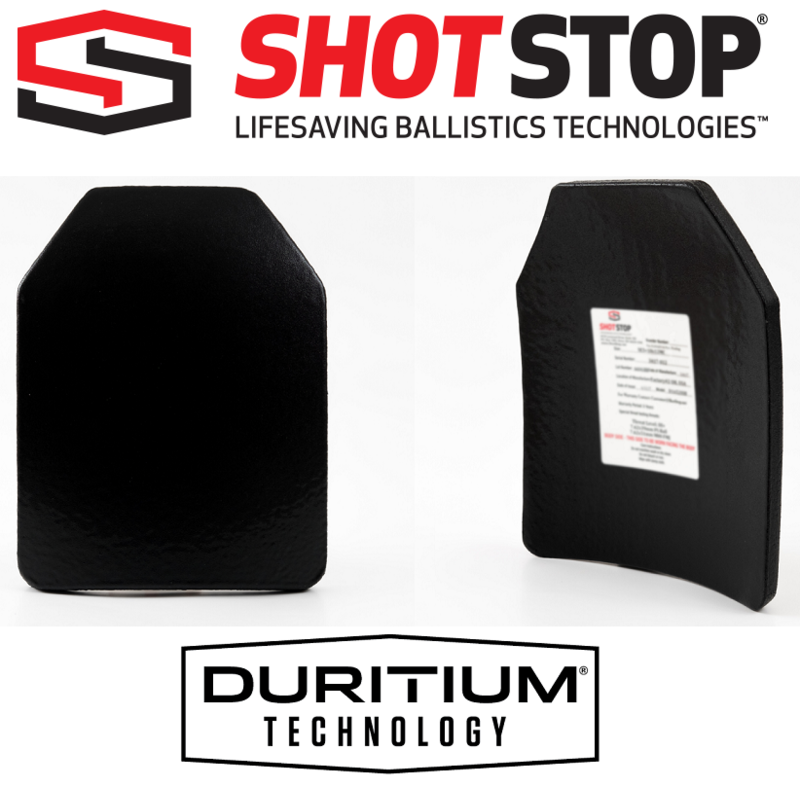 Duritium® is a portfolio of patented, patents pending and proprietary technologies that enables ShotStop to create advanced armor to protect against ballistic, blast, spike and edge threats far more efficiently than all other global competitive technologies and systems. This does include our very own formula of UHMWPE (made by ShotStop Ballistics). The GT plate is a hybrid plate (strike face AND poly system) that has a proprietary alloy composite strike-face which has been vulcanized with rubber and a few other proprietary ‘twists’ which eliminates the all-too-common glass crack effect that other plates with ceramic strike faces have to deal with when not treated gingerly or when struck by bullets. And then behind the strike face, our Duritium® X1 UHMWPE is there to catch the flattened projectile (after the strike face has had its way with the bullet). All of this said, the heat of trunks (and also of arctic conditions) and the cycles of winter and summer do not effect the performance of the GT plate. Why does the ShotStop UHMWPE resist heat damage when the others do not, made of same material? ShotStop’s UHMWPE is very similar but does have some molecular differences in formula. That said, the ballistics capabilities of Duritium® don’t start to be affected until ~250 degrees. The GT plate is guided by the strike face which obviously has much much higher heat resistance. So the ShotStop UHMWPE could do the ‘flattened bullet catch’ at temperatures much higher than that minimum ~250 degrees – thanks to the GT strike face deforming the bullet and putting it out of it’s spiral rotation before the Duritium poly has to catch it. This is why trunk heat is not a threat to the GT plate. I now have these Duritium GT Plates in my plate carrier. When I first put them in, there was a noticeable difference between the thickness of the competitors plate that I had at the time, at over 1" thick, versus the GT plates at .55". It was a noticeably more comfortable difference, and I had to adjust the plate carrier to fit again after losing the extremely thick plates. 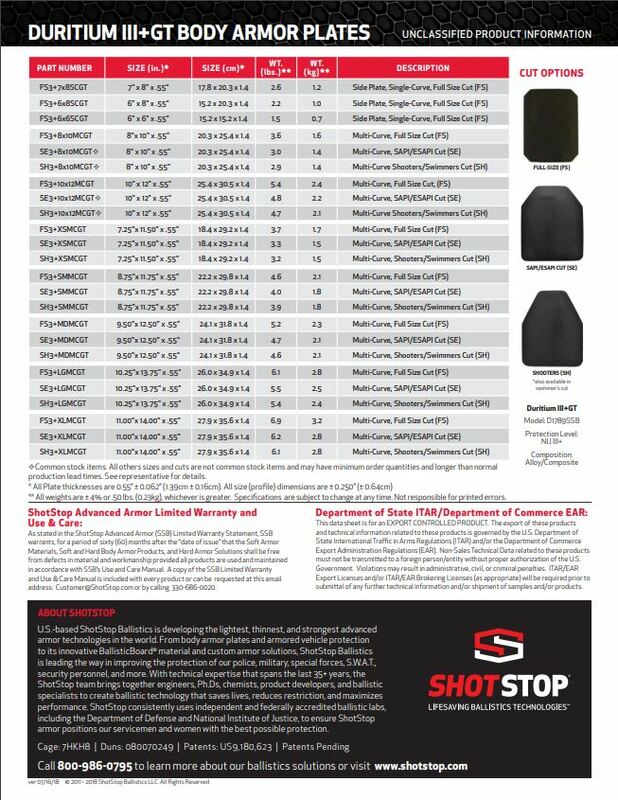 If you are interested in other levels of protection, including ballistic board and backpack rifle rated armor, as well as lighter non-GT rated rifle plates, then check out the ShotStop site and get back to me: opsmvt@gmail.com.